ANIMAL NATION DOESN'T KNOW ANYTHING. : New Album - Every Day In The Life - coming this fall on UrbNet. New Album - Every Day In The Life - coming this fall on UrbNet. We're going to be releasing a new album in the fall. 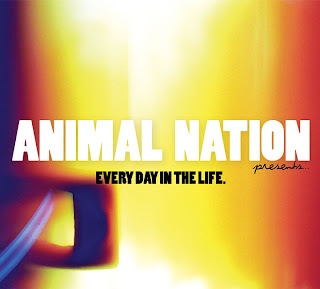 It's going to be one of two solo albums by Animal Nation. It is going to be so freaking AWESOME. I did all the production on it, and I learned a bunch of instruments making it, and recorded all the vocals in this creepy old barn in a run down town called Woodville in Ontario, and I moved to Halifax to write all the lyrics, and I wrote nearly every day at a hidden little beach at the end of South Street, and it's a concept album! A real concept album! Not a concept album in the sense that Sgt. Peppers is a concept album, but more so in the vein of Prince Paul's "A Prince Among Theives". An album that tells a story from start to finish, and nearly every song connects to the next song, and I spent way too long in my house being really antisocial making it, and I had this really cool girlfriend at the time who I left for some reason because I couldn't do anything but think about making this album and now I kind of regret it a little maybe, but it's cool, because it is so freaking AWESOME. Change it to 720p for better sound quality. I'm in the middle of making a music video for my favorite song on the album right now. It should be done around September. I'm filming it myself. I have no idea what I'm doing. Until then, above is the other half of Animal Nation - Mike's favorite song on the new record. The track is called "Brush Your Teeth (Ch-ch-ch-ch)", and pays a serious homage to the man that steals kids hearts (not literally), Raffi.